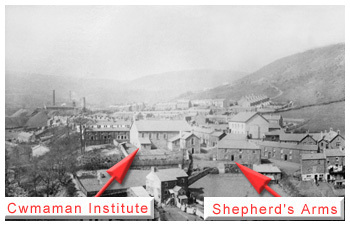 CWMAMAN INSTITUTE Probably the first lasting venture of its kind in the Cynon Valley, was opened in March of 1868. Originally opened as a reading room within a house provided rent-free by the Cwmaman Coal Company, it moved in 1881 to 10a Railway Terrace. In 1884 the workmen of Cwmaman Colliery agreed to a poundage scheme, whereby a half-penny in each pound of their wages would be deducted weekly in support of an expanded institution at the Tea Caddy Shop at numbers 130 and 131, Glanaman Road.This location soon proved to be insufficient and a building committee was appointed by a public meeting in 1889. A 99-year lease for land on the Cwmneol Estate was negotiated and an architect, Thomas Roderick of Clifton Street, Aberdare and builders, Messers Powell and Mansell of Cardiff were engaged. The completed building was formally opened by Lord Aberdare on the 25th January 1892 and included a public hall with seating for 700, reading rooms, a billiard room and a caretaker's cottage. Progress was temporarily halted when the building was destroyed by fire on the 19th April 1896. However restoration work was soon under way and the restored institute was completed by about January 1897. Later additions to the building were made in the shape of a lesser hall in 1906 and a single storey building in 1925.The Institute soon became the cultural centre of the community holding, eisteddfodau, Colliery Lodge meetings and becoming officially linked with the Cwmaman Brass Band in 1912. The library also prospered and by 1911 contained a total of 4,273 books: 3,679 in English and 594 in Welsh. Above: Cwmaman Institute circa 1895 prior to the fire which completely destroyed the main building. In the middle distance (left) is Fforchaman Colliery and in between the two stacks in the far distance Cwmaman Colliery can just be made out. The new housing is still in pristine condition in the 1890's but later conditions deteriorated as the mine workings grew. The depression years saw a dramatic decrease in income from the collier's poundage scheme and in the years 1920 - 1926 the institute lost almost 83% of its income from this source. Despite this and with the aid of grants from the Miners Welfare Commission the institute played a vital role in helping to alleviate the suffering of the community. Fund raising, providing food and carrying out political work became the main features of the institute at this time.The years following the Second World War were spent in reviving the cultural life of the community. This involved not only reviving established cultural activities such as the Institute Silver Band but introducing new innovations to accommodate the changes in social patterns and values evident after World war Two. These included the introduction of a public cinema in 1954 and the opening of licensed premises in 1967. Cultural activities were still encouraged and in particular live theatre productions began to flourish again, leading to the founding in 1972 of the Institute Theatre Group. In 1992/1993 extensive external restoration was made possible by a Welsh Office grant under its urban aid programme. Today the institute remains the busy centre of its community and although many of its functions have changed greatly it still holds firmly to the principles of community service.